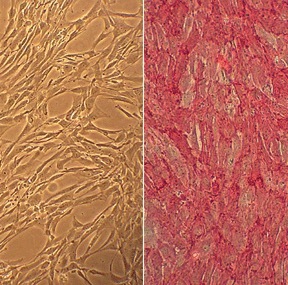 Human Brachiocephalic Artery Smooth Muscle Cells (HBcASMC) provide a useful in vitro system to study all aspects of cardiovascular function and disease, especially those related to mechanisms of hyperplasia and hypertrophy of intimal smooth muscle cells leading to vascular occlusion in atherosclerosis and stent restenosis. (Click to Enlarge) Human Brachiocephalic Artery Smooth Muscle Cells: HBcASMC. Isolated an artery of the mediastinum that supplies blood to the right arm, the head and neck.